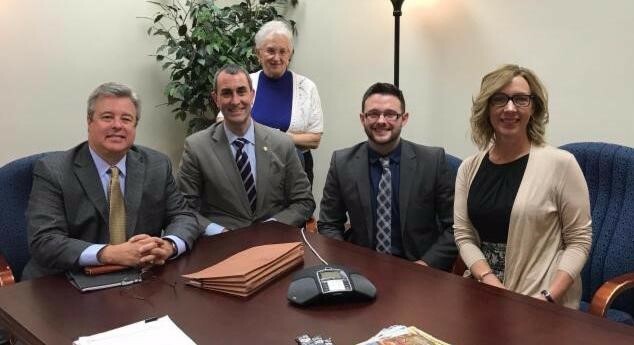 Last week, U.S. Rep. Virginia Foxx of North Carolina’s 5th District met with representatives from Surry-Yadkin EMC, North Carolina’s Electric Cooperatives and the National Rural Electric Cooperative Association (NRECA) at her district office in Clemmons. The group discussed legislative topics important to the co-op, its employees and its members, including the pension plan bill currently being considered by Congress and access to healthcare in rural areas. Congresswoman Foxx is the Chairwoman of the House Committee on Education and the Workforce, which deals with issues like the pension plan bill. (Left to right) North Carolina’s Electric Cooperatives Director of Government Affairs Jay Rouse; NRECA Senior Associate Director Legislative Affairs-Benefits Chris Stephens; Rep. Foxx; Surry-Yadkin EMC Manager of Public Relations Adam Martin; and Surry-Yadkin EMC Vice President of Administration Donna Marion. The pension bill, H.R. 3596 – Rightsizing Pension Premiums Act of 2017, would lower the pension insurance premiums cooperatives pay by 80 percent. Last week, U.S. Rep. David Rouzer signed on as the first co-sponsor of the bill from the North Carolina Congressional delegation, and this week, U.S. Rep Walter Jones joined as a co-sponsor.